I had to harmonize a piece in E major with a given melody. The image below shows the end of the piece, with my harmonization. Normally, I would write the first beat of the second-to-last bar as B in the bass, B in the tenor, D# in the alto, and F# in the soprano, i.e. the Vth chord of E major. But, does it make any sense to write the chord depicted in the image, instead of the standard V chord? Does it have a name? To my ear, it sounds like a cadential 6/4 chord, but I think it's not, since it contains F# and not G#. 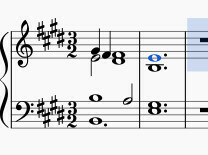 Can I have this form of cadence, or, is this a way to end the piece? Thank you in advance, and have a happy New Year! What you wrote is a perfectly good cadence. A passing tone (PT) or passing note is a nonchord tone prepared by a chord tone a step above or below it and resolved by continuing in the same direction stepwise to the next chord tone (which is either part of the same chord or of the next chord in the harmonic progression). It does sound a bit like a 6/4 chord - but there is nothing wrong with writing a harmonic progression which creates a sense of ambiguity for the listener, and then resolves it. Others may want to call it a suspended 4th chord (even though the E isn't a suspension because it isn't the continuation of an E at the end of bar 1) or a dominant 11th. But if you wrote it because it sounds right, that's more important than giving it a pedantically correct name! Whether you are "permitted" to do such a thing if you want full marks in an exam is a different issue, of course. "Passing music exams" and "writing music" are not necessarily the same thing! As a very minor point, it would be more usual to write the F# in the top part as a single dotted-whole-note, not as you did. Most music notation software should be able to handle three "voices" or "layers" with independent rhythms on one stave. I think what you want is a note of anticipation in the First beat of that second bar, you are just going about it a little bit wrong. Have your full chord and just go the F sharp on the weak part of the pulse in the manner of a non-chordal note. Your chord choices are good. You have a Tonic 6/4 going to a Dominant chord with the use of a seventh. Your voice leading just needs to be a little bit better. Shall we call this an 'unprepared suspension'? Or an 'accented passing note'? It gives a satisfing alto line, which is probably more important than vertical analysis. Plenty in common with a cadential 6/4 indeed. Not the answer you're looking for? Browse other questions tagged chords composition harmony cadence or ask your own question. What are the benefits of determining form before composing? How can this simple bass line be categorized in chords or scales? Can you introduce fugue themes in the middle of a measure? If so, how? In Four Part Writing, is an augmented unison interval in a single voice allowed? Harmonising cadences given the bass line. When and when not to use inversions? What are the chords in this bridge's cadence?